The MY17 RANGER XP 1000 EPS boasts all of the fundamental RANGER features plus some brand new features. The RANGER XP 1000 features a ProStar 1000cc 80 HP engine, Electronic Power Steering, All Wheel Drive with Turf Mode, 25.4cm front and rear Suspension Travel, 454kg Dump Box, 907kg Towing Capacity, Seat Belt Interlock, Speed Key ready and a range of new Accessories. New for 2017 is “Three- Mode Throttle Control” explained further below. ProStar 1000cc Engine – The most powerful utility side-by-side engine ever! The ProStar 1000 engine is tuned to put out a category leading 80 HP for full-on power right when you need it. Twin cylinders ensure smooth operation and gives low end grunt for serious towing and carrying. 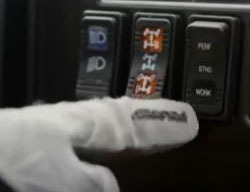 With XP 1000’s standard throttle control modes, you not only get the most power in the industry, but unparalleled control over all of the 999 cc’s. 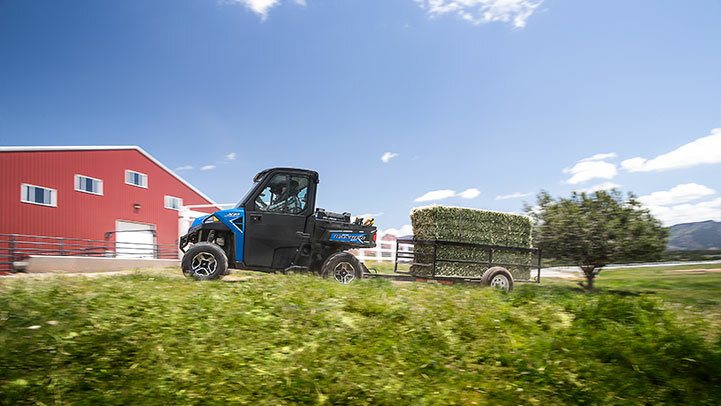 There is Work mode for when precision is needed such as backing up to hitch a trailer, Standard for a traditional blend of throttle to power output, and Performance for when you are ready to go all out. The ProStar 1000 engine is tuned to put out an industry leading 80 HP and 61 lb-ft of torque for full-on power right when you need it. Twin cylinders ensure smooth operation and gives low end grunt for serious towing and hauling. Pro-Lock is our fastest engaging AWD system ever! All four wheels engage near instantly when your vehicle needs more forward traction and reverts back to 2WD when it doesn’t,. 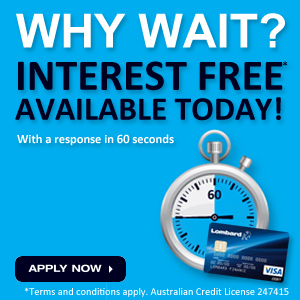 No need to wait for pressure to build up or to stop and lock in a diff like our competitors. Also, when in 2WD, the VersaTrac Turf Mode switch unlocks the rear differential for easier, tighter turns that won’t tear up your lawn. With 2,000 lbs. 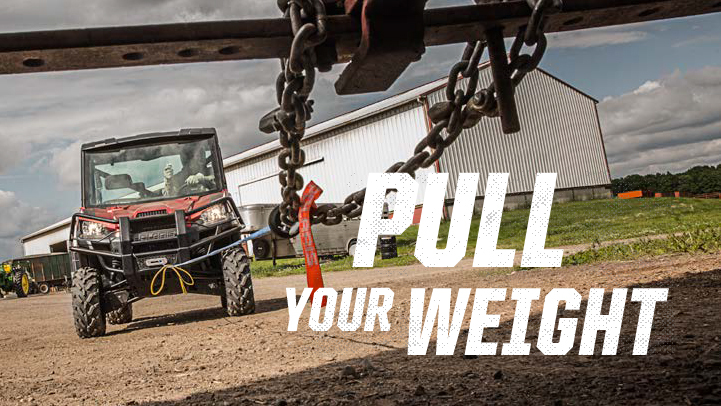 towing capacity and standard 2” receiver, the RANGER XP 1000 allows you to tackle the toughest jobs with confidence. Additionally, a class-leading 1,275 lbs. payload capacity is highlighted by a rear box with gas-assist dumping operation that can tote up to 1,000 lbs. of materials and a full-sized pallet. 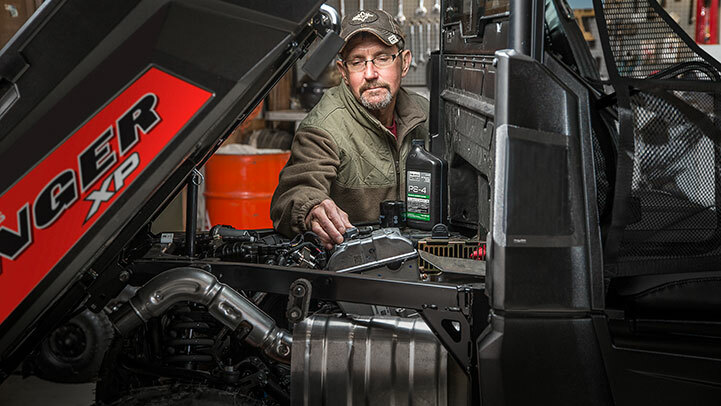 RANGER is engineered to make maintenance quick and straightforward with easy to access service points for the oil filter, dipstick & drain plug. The Polaris Engineered PS-4 Extreme Duty and PS-4 Oil Change Kits are engineered to offer the right protection for your engine, the right amount of oil and the right filter to get the job done fast so you can get back to riding. The XP 1000 EPS models come with premium paint straight from the factory. This finish is eight times more stratch resistant than normal plastic bodywork for long term durability. Machined aluminum wheels also come standard for added style and performance. A full 25.4 cm of Dual A-Arm suspension travel up front and 25.4 cm of Independent Rear Suspension travel keeps the ride smooth, even when hauling up to 680.4 kg of payload and towing up to a full ton! Adjustment collars give you the option to set the spring pre-load based on the amount you need to haul. 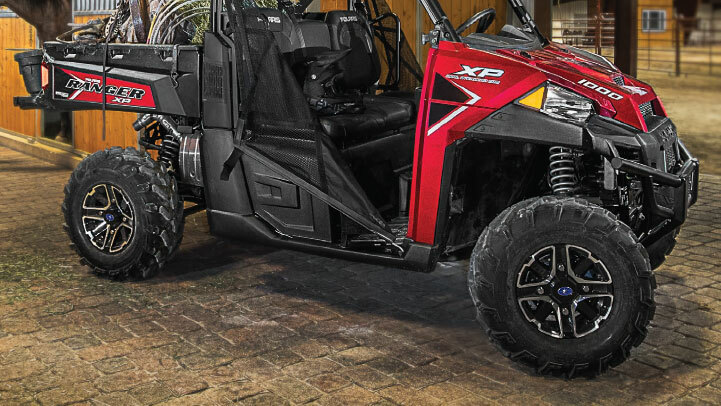 To navigate deep ruts, roots, and trail obstacles it takes more ground clearance, RANGER XP 1000 gives you a full 31 cm of ground clearance so you can go farther and get more done. That is 9% more clearance than the Can-Am Defender HD10. RANGER’s wide bench and soft seating provides all-day comfort for up to 3 people. RANGER is also purpose built to make it is easy to get in and out of the cabin throughout the day with over 25.4 cm of boot clearance and 71 cm of cab opening. 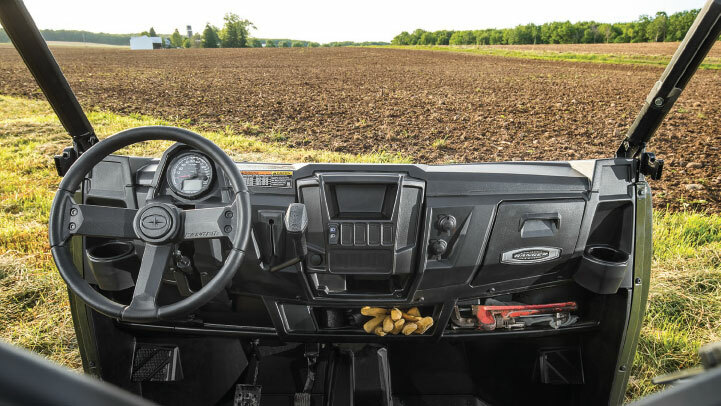 With the RANGER XP 1000, enjoy a 57 L of in cab storage that includes plenty of easy-to-access in dash storage that keeps items at the ready when they’re needed. Compare that to Pioneer 1000 that only has 19 L of cabin storage. The smoothest, most responsive electronic power steering available, with Variable Assist for easier steering at lower speeds and more response as speed increases. Our EPS lets you work and ride all day with less fatigue. 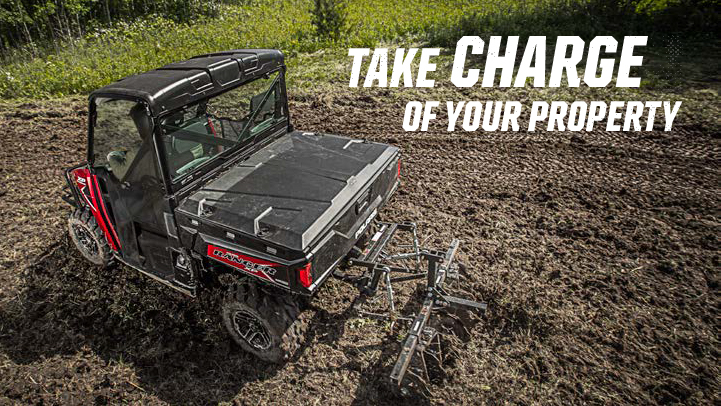 Add four-season versatility and unmatched comfort to your RANGER with a Lock & Ride Pro Fit cab system. Designed exclusively with, and for, your machine, Polaris Engineered cab components fit perfectly, install easily and seal tightly keeping the elements out and you protected. Stay one step ahead of changing seasons for years to come. Only Polaris RANGER has the power, comfort, and legendary RANGER versatility to haul more, tow more and do more for your property. 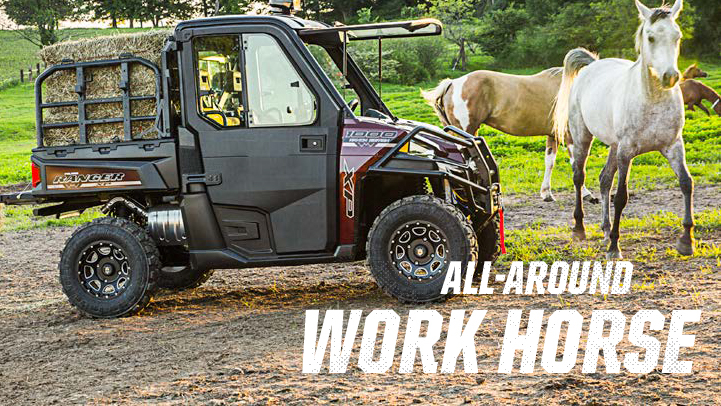 With Polaris Engineered Lock & Ride accessories you CAN GET MORE DONE. Polaris PRO HD & HD Winches provide the extreme durability you would expect from the off-road leader. Our winches and installation kits are built to fit right with your machine and are fully sealed, so no matter what you encounter you know your winch will work on command. Polaris Northstar coolers survive just about anything – from extreme heat to a full-on bear attack. Ice will stay cold for hours on end, and anything inside will stay locked up tight. A tire specifically designed for RANGER Owners. Tread pattern designed to withstand anything from the farm yard, to the pastures to the trail. With 10-Ply it can carry the load day-in and day-out. Perfect for your garden or food plot — material spreaders, 3-Point Hitch System, sprayers, lift boxes and more provide on-demand solutions for your work.